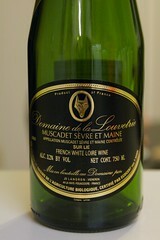 The Hermine d'Or designation is given to high scoring cuvees of Muscadet that are tasted blind. This 2007 from Joseph Landron has a delicious crispness, acidity layered with ripe green plums and green apples. This probably could age for 2-3 years. The 2007 Domaine de la Louvetrie Muscadet de Sevre et Main Sur Lie Hermine d'Or - from 40+ year old vines in gneiss, sand and chalk - smells of peach, fresh lime, and narcissus. Satiny in texture yet displaying the high acidity typical of its vintage (accentuated by dissolved CO2), it lays down impressively long, citric, saline, chalky traces. Enjoy it anytime over the next two years.